Good people are your organization’s most critical asset. But what does it really mean to be good? Leaders love to say that any company is only as good as its people, but tend to evaluate candidates and employees more by their measurable accomplishments than by their “softer” qualities, like integrity, compassion, and other values. Bestselling author Anthony Tjan is leading a movement to change the way we think about goodness so that we can become better judges of people and create more goodness in ourselves, in others, and in our organizations. Drawing from his own experiences as an entrepreneur and venture capitalist, Tjan also taps into the wisdom of his relationships and interviews with extraordinary innovators, executives, artists, academics, teachers, and role models from all disciplines and walks of life. The cases and profiles shared include: Harvard Business School Dean Nitin Nohria, who has called for balancing leadership of competency with leadership of character; Supreme Court Justice Sonia Sotomayor, who has never forgotten her roots and shows profound kindness to her staff and clerks; Hollywood talent manager Shep Gordon, who has counseled his clients on the importance of generosity and gratitude; legendary venture capitalist Henry McCance, whose success proves that humbly ceding the spotlight to others makes room for their greatness; and master jazz musician Clark Terry, who devotedly mentored the young, blind pianist Justin Kauflin. 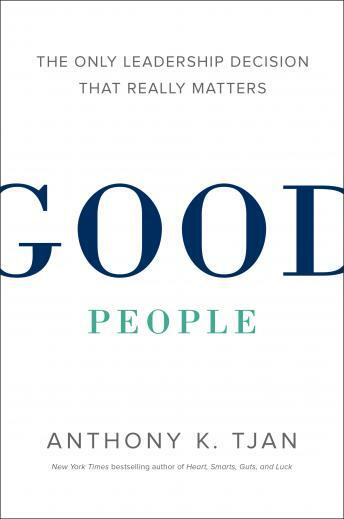 Packed with practical yet often surprising advice, Good People establishes a new language and framework you can use to evaluate, develop, and lead with goodness. Tjan will convince you that there is a hard truth in the “soft stuff” of business, and that choosing and working well with good people is truly the only leadership decision that really matters.